Wash and dice potatoes, leaving the skin on. Cook potatoes in salted water. Add all other ingredients, salt and pepper to taste. With electric hand beater, mix until creamy. 18 members have added this recipe to their cookbook. 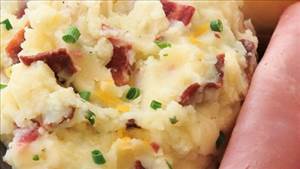 There are 503 calories in 1 serving of Loaded Mashed Potatoes. Calorie Breakdown: 38% fat, 45% carbs, 17% prot.